These chilies are the perfect touch to gladden a simple cheese sandwich or to give a point of flavor to some tasty beef tacos. Whenever you want to give a strong and spicy flavor to a dish – don’t forget to turn to the fought chilies. 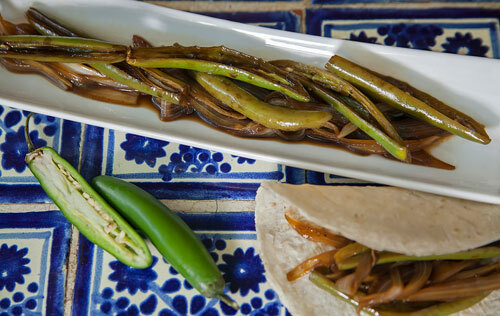 The beauty about this recipe is that not only chilies will be found in the salsa bowl... they are also accompanied with fried onions and a magical juice that is used to season them . You will love all this combination. The use of the word “fought" to name this recipe is strange . But the reason for which this name was assigned is because in the past before cutting and frying the chilies they were rubbed against any surface with the hands. This makes that the oil from the seeds distributes to the chili, causing it to be even more spicy . Possibly this action resembles to make a bull angry. *If you want to add this step to the preparation, we recommend that you do it with a rag or with gloves; so your hands don’t get burned. This recipe is prepared with few ingredients, with few utensils and it is easy to make. When the chilies are fried they release a very strong smell. If you want to wear a medical face mask it’s a very good idea. In this recipe the serrano pepper is used but it could be substituted for jalapeno pepper so the salsa becomes a little more spicy. Just make sure of having 8.8 oz of jalapeno peppers. The recipe is given with olive oil because it gives more flavor to the chilies although a type of vegetable oil could also be used. In less than 10 minutes the fought chilies will be ready. This recipe is for 2 cups. Cut 20 serrano peppers lengthwise, then put them in a bowl and reserve. If you want your fought chilies with a lower degree of hotness, discard the seeds and veins of the serrano peppers..
Cut 1 onion into strips, then pass them to the bowl. The juice of 2 Limes. 4 tablespoons of Worcestershire salsa. 4 tablespoons of Maggi seasoning. Mix very well the bowl ingredients with a mixing spatula, then set aside. Heat in a frying pan over medium heat 1½ tablespoons of olive oil. Incorporate in the frying pan all the bowl ingredients and fry them for about 3 minutes, until the chilies are well fried; stir regularly. Recommendation: Try the fought chilies with some tacos al pastor and feel the difference . Variation: If you liked the flavor and the hotness of the serrano peppers, now try them in the chili macho salsa. Did you like the Chilies? Although you don’t believe it there are many types of Worcestershire Salsa and this one is the one that has the best flavor, that will go perfect with these chilies. This is the Maggi Seasoning that has to be used to prepare the fought chilies. Use a comfortable lime squeezer so it will be easier to squeeze them.